Regular readers and those who know me “beyond the blog” know that knitting helps keep me balanced. I love the creativity and challenge, but the repetition and focus help to quiet my mind — and I’m convinced, make me a better person. I love having something to concentrate on — to do — during life’s “down times.” Waiting for a medical appointment, watching TV, sitting around talking after supper, or riding a bus, train, or plane. My daily morning run serves the same purpose — getting out by myself, moving, breathing. A psychologist friend once explained that I’m not “in relation” to anyone during that time — I’m not a mother, wife, daughter, consultant, sister — so I can just be me. Makes sense. As my favorite poet-artist, Brian Andreas of Storypeople, conveys in this “story” that hangs by our back door. Go to his site and look at the prints. They’re wonderful. The power of these two habits has become abundantly and viscerally clear in the past day. 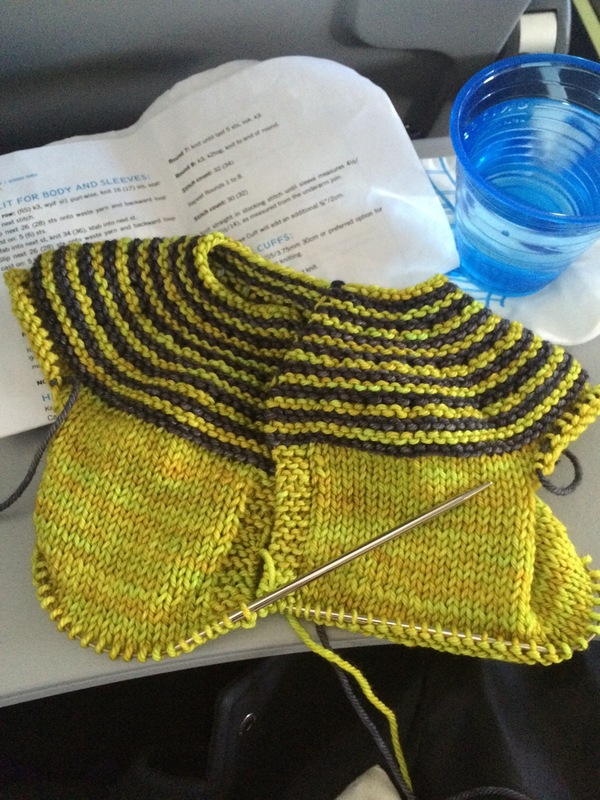 I used the last of my yarn on the Gidday Baby sweater on yesterday’s flight. I hadn’t brought the next skein from home. Ah well. I still had my book and running stuff in my bag, which I’d checked through to my “final destination” because the flight was totally full. 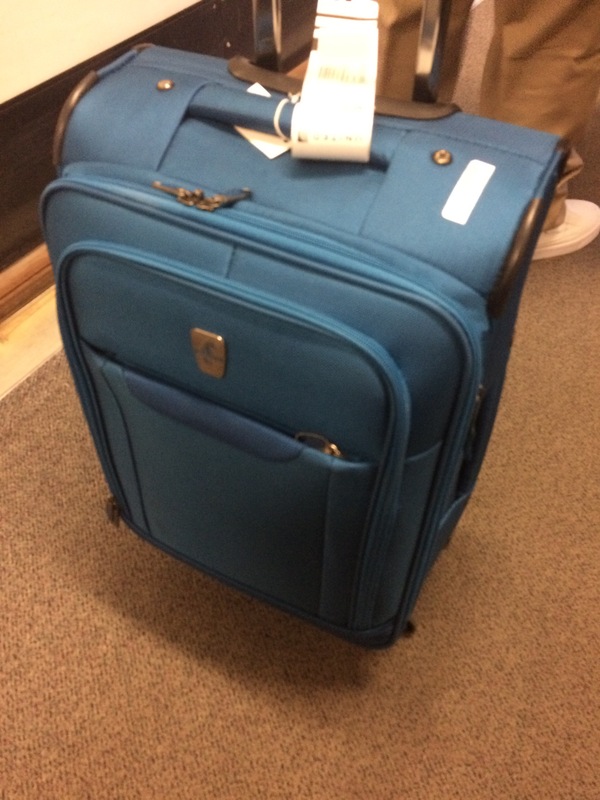 But my flight was canceled, and I ended up flying into another city and renting a car to drive to my “final destination.” However, my bag — which I’d taken a photo of just in case — never arrived. And, despite this lovely photo, it didn’t and still hasn’t. It’s not even been located, according to the automated customer service system. So I find myself without my knitting, without my running stuff, without my clean clothes (except for new underwear from Walgreen’s – yes, 2 pack of cotton bikini), without my library book. Except for the undies, I haven’t had time to remedy any of these situations. I’m feeling the most out-of-sorts — downright cranky and occasionally weepy — that I have in quite a while. So I wonder — after a very long and busy day, how do people do this life thing without knitting or running? I haven’t always been a morning person. A poster of Snoopy draped over his doghouse declaring “I think I’m allergic to morning” hung in my bedroom throughout my teenage years. As the mother of teens, I have to wonder whether it’s physically possible for a teenager to be a morning person. But I digress…. Nearly every morning for the past decade or so, I’ve woken before everyone in the house and slipped out the door for an hour or so of movement — usually running but sometimes walking. Most days I’m alone although Wednesdays are reserved for a walk with Liz, a sister-friend from childhood (4th grade at the Pleasant Street School) who lives 1.5 miles away. As I run through the streets, my mind kicks into gear. Sometimes I let thoughts pour out and flow where they will. Like someone gathering seashells — picking up each one, considering it for a moment, then putting it aside into a pile, perhaps to be gathered later or perhaps to be washed back into the sea. Sometimes I mentally grab a topic and mull it over — thinking of conversations that I need or want to have (or wish I’d handled better), organizing a work project, drafting something I need to write (and hoping I’ll remember it by the time I get home). Always I pray, thanking the good Lord for getting me up and out, for a body that works even when achy or slow, for a safe place to run, for my many blessings, especially those still sleeping at home. And then there’s my list — friends, family, people I’ve never met (friends’ parents or siblings, colleagues, even world leaders) who may need a bit of extra help during the day — I pray that they’ll feel peace, strength, love, courage, and grace when they need it the most. And really, who can’t use a little of that each day?! Of course, there are mornings, especially in the dark days of winter when the sun doesn’t rise until after 7 or when I’ve only had a handful of hours of sleep, when I’m tempted to stay in bed. But I know that if I don’t spend some time with just myself, I’ll feel unsettled for much of the day. A few years ago, I discovered a poem that captures perfectly what I’d, until then, been unable to explain about why this morning routine is so important to me. This quirky print hangs by my back door. it’s easier to remember who I am. When a friend who’s a developmental psychologist saw the print, she said, “Oh, of course, you’re not ‘in relation’ to anyone at that point.” Exactly. I’m not a mother, wife, worker, sister, or friend. All those are part of me, but for an hour or so before dawn each day, I’m just me.